Bethenny Frankel is hitting back at Halloween costume critics. “The Real Housewives of New York City” star took on commenters who slammed her and the Kardashian sisters for dressing as Victoria’s Secret Angels for Halloween. “For those haters, I suppose that monetizing reality tv is not the only good idea that the Kardashians and I have shared simultaneously. 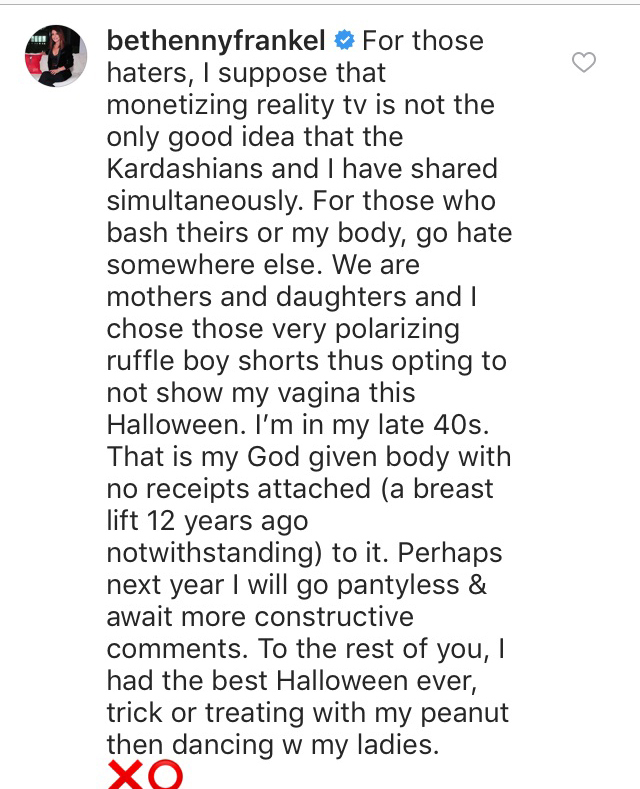 For those who bash theirs or my body, go hate somewhere else,” Bethenny wrote in the comments of her Halloween Instagram post. Following the reality star’s epic post, her page was flooded with support from fans. Bethenny first shared the pic showing her as an angel – taken by Nicky Hilton – on Halloween. “Heaven can wait #superangel,” she captioned the pic.